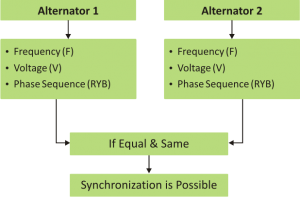 The process of connecting two alternators or an alternator and an infinite bus bar system in parallel is known as synchronizing. Generally, alternators are used in a power system where they are parallel with many other alternators. When there is maintenance or an inspection, one machine can be taken out from service and the other alternators can keep up for the continuity of supply. Load supply can be increased. During light loads, more than one alternator can be shut down while the other will operate in nearly full load. The operating cost is reduced. Ensures the protection of supply and enables cost-effective generation. The generation cost is reduced. 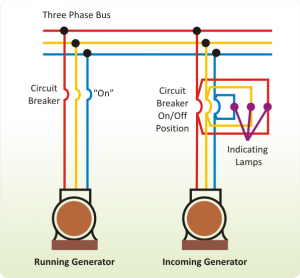 Breaking down of a generator does not cause any interruption in the supply. Reliability of the whole power system increases.